Today was a good day. I got the doors painted and met the neighbors. This truly is a mushers paradise. There are mushers all around me. Three that I know of and two of them run Siberians! I can sit in my quasi-living room and see the tallest peak in North America, Mount McKinley, some call her Denali. What a beautiful sight (at least when the day is clear). The neighbors across the street have 20 Siberian Huskies of varying lines and they plan to run the Iditarod someday too. We spoke for about 20 minutes and she give me the cliff notes version of the goings on in this neck of the woods. We talked about the miles of trails right out my backdoor and she was kind enough to forward me a trail map that looks like at least a forty mile loop. We also spoke about the Willow Dog Musher’s Association and its upcoming meeting and sled dog history workshop that is coming up in September. For those of you who don’t know, Willow, AK is the official start of the Iditarod and I am literally miles from the trail that could take a dog team all the way to Nome. Is that paradise or what? Many mushers think of moving to Alaska and it is on their to-do list or bucket list or whatever you want to call it. As I have said before I have thought about this move every day for the past decade and fleetingly since I got my first Siberian way back in 1987. I only ask myself; what was I waiting on? I have never lived in a small town like this where I have to drive about five miles to get my mail at the Post Office or 30 minutes to the closet grocery store. It is something I will have to get used to, but so far I am digging it! I have heard so many stories from my musher friends who came up here with a couple hundred dollars in their pocket and made it work. 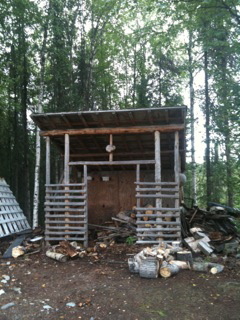 One musher that I know just installed running (hot) water in his cabin that he has lived in for 12 years. This is a different way to live up here. We have two (working) outhouses on our property and we could use them if we had to. I remember when Michele and I first started talking about Alaska when our daughter was only two and having running water and electricity was a must. My neighbors said that they work in Anchorage, about an hour away in summer and I am guessing an hour and a half in the winter. While that seem like a far commute, when Michele and I used to live in the Mountains in Colorado, we would drive to Denver everyday and it was just as far. Our plan is once we get the family up here we are going to open a dog training center in the City and offer day care and swimming pools similar to what is offered at Canine Fitness and Fun Center in Denver. As far as I know there is nothing like that up here and it will be a great place for pet owners to bring their dogs. Today, I try and tackle the woodpile. It has at least 500 logs in it and I need to get it stacked and out of the rain before I need to build a fire every day to heat this place. I welcome you comments and suggestions. Please comment below. Welcome to Alaska! I gather you are a fellow Siberian Husky lover, we have four, two of which came from Pat & Richard Tiedy of Aniak (http://www.easysite.com/aniaksibes) in Wasilla. Have you met them? They are great people. No haven’t met them and thank you for the warm welcome! To say that Richard is a handyman is an understatement. The Tiedys did something similar to what you are doing with our famous “Alaskan Fixer-Uppers,” and built a fantastic kennel for their Siberians. We love Siberians and are glad to see more teams in the Yukon Quest and Iditarod. Think about the Quest, too, it will start in Fairbanks in 2013! Thank you! I looked at their pictures. Quite a big job on their barn! I really know what you talked about to move up north and start building your knew home. I lived for 10 years around and above the polar-circle in north-europe (sweden and norway) and built my own husky-camp with mostly ~60 dogs. Life can be so beautiful but also harsh and hard.